Prepare with Pegasus and PASS. Guaranteed! Not just hype - our students PASS or return for FREE. We are so confident in the quality of the courses that we offer free, unlimited viewing of your registry eCourse if you do not pass your credentialing exam. How can we offer a guarantee? 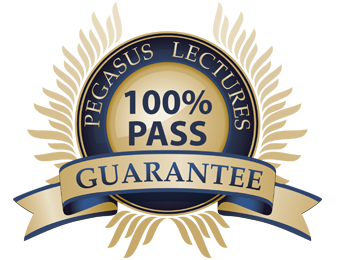 It’s simple - our pass rates have exceeded 90% since the inception of Pegasus in 1992. These statistics are unparalleled in the industry. We can offer a pass guarantee because our students are so successful on their credentialing exams. We don’t sell “shortcuts”; we teach. Our seminars are designed to teach the material in the easiest and most straightforward way possible. Our seminars avoid gimmicks and are geared toward really teaching the material so that no matter how a test question is posed, you can think your way to an answer. Instead of telling students that they need to learn “just enough” to get by, we teach them how to incorporate the physics and specialty ultrasound principles into their day-to-day scanning. By teaching the material in the clinical context, understanding and recollection become much easier. Our pre-course preparation and post-course study guidelines reinforce the concepts taught in class. How do I qualify for the Pegasus Pass Guarantee? Sit for your credentialing exam within six months of completing the eCourse. If you are not attending a live seminar, you will need to designate a proctor (supervisor or medical director) to verify your completion of pre-class work (if required) and viewing of the online eCourse modules. If you do not have a local proctor, please contact Pegasus Lectures for other options. If, for any reason, you do not pass your credentialing exam, a faculty member will provide guidance to target areas of weakness. We will work with you until you are successful. Call our office at 972.564.3056 or email info@pegasuslectures.com.